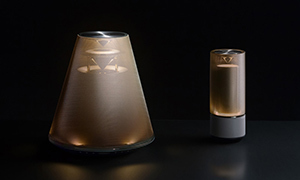 Yamaha Corporation's "Relit LSX-70 and LSX-170" lighting audio systems were awarded the DFA (Design for Asia) Bronze Award in the "Product & Industrial Design" division in the Design for Asia Awards 2015 program. To date, Yamaha has received four DFA Awards, including a Grand Award for its SILENT Brass™ muting system for brass instruments in 2014. Both lighting audio systems enable users to easily listen to musical content transmitted via Bluetooth® wireless systems from their smartphones, tablet computers, and other sources. With a dedicated application, users can adjust the sound quality and set timers for the music as well as lighting functions from their mobile devices. In addition, the speakers offer 360-degree sound projection, thus enabling them to blend into daily life scenes and bring soothing music and luxurious lighting at mealtime and for relaxation. The Design for Asia Awards (sponsored by the Hong Kong Design Centre) is a design prize program that was instituted in Hong Kong in 2003 to celebrate design excellence and acknowledge outstanding designs with Asian perspectives. DFA awards are presented to companies and designers whose superior work reflects Asian lifestyles and are influential in the design field. Awards presented comprise Grand Awards, three Special Awards, and Division Awards that are presented in the four categories of "Apparel & Accessory Design," "Communication Design, "Product & Industrial Design," and "Environmental Design." In each of these divisions, a range of awards are made, including Gold Awards, Silver Awards, Bronze Awards, and Merit Recognitions. In last year's DFA Awards 2014 program, there were more than 1,000 designs from 23 countries and regions entered in the competition. Overall, a total of 168 awards were presented to entrants, including 3 Special Awards, 10 Grand Awards, 10 Gold Awards, 25 Silver Awards, 52 Bronze Awards, and 68 Merit Recognitions.